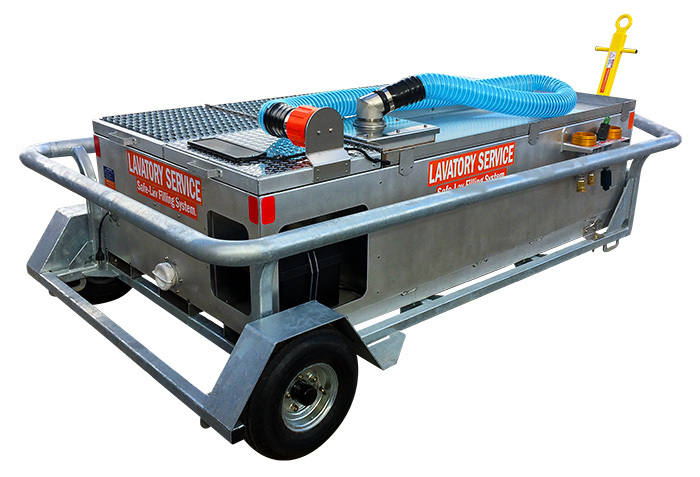 Our new “Safe-Lav™” LC270-RJ3E-SL Lavatory Service Cart features a 3-gallon batching system to eliminate inadvertent overfilling of aircraft lav systems. 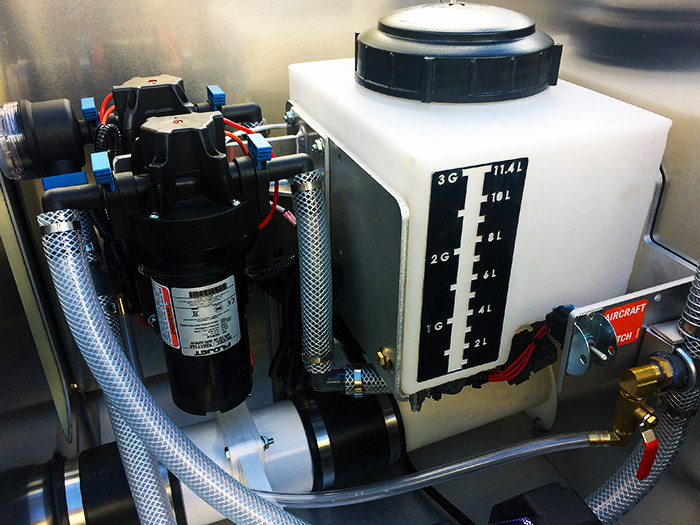 Ideally sized for corporate aircraft lavatory systems, this unit eliminates costly operator and meter failures. AERO’s patented “Safe-Lav” system utilizes a dedicated batching tank to determine and restrict the maximum quantity of fluid that can be delivered to the aircraft lavatory system. Our direct-reading tank & delivery system is unaffected by inaccurate or broken flow meters (which are the leading cause of messy lav system overfills). A single overfill can cost thousands of dollars in aircraft damage – not to mention aircraft downtime and the loss of a good customer. Protect your good name – install AERO’s “Safe-Lav” system on all your lav servicing equipment! 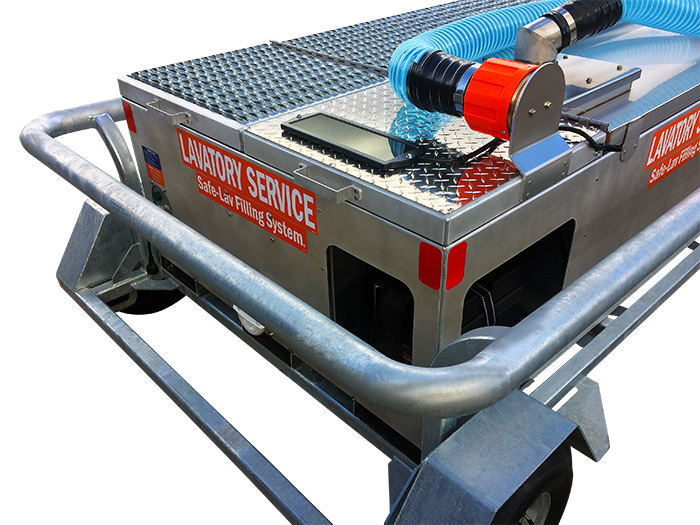 Created for the busiest and most demanding customers, the LC270-RJ3 series units are the most durable and robust carts available on the market. A heavy-duty galvanized frame completely wraps the unit, protecting it from potential damage. The cabinet is constructed of heavy-gauge aluminum with a grip-strut work deck. The waste hose sits in a special drip-tray that allows any spillover to be flushed through the integrated drip-tray drain. 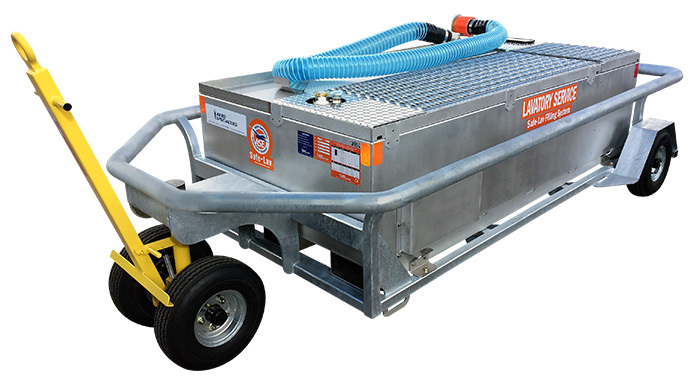 As stand-alone units bolted into a trailer, the Electric LC270-RJ3E-SL is the industry’s only “convertible” lav cart: it can be inserted into a 3/4-ton pickup truck to change the carts from towable to drivable (see the LC270-Insert). The 46-inch (116.8cm) deck height (made of grip-strut and diamond-plate steel) is low enough for servicing regional jets but provides plenty of height for servicing larger jets. 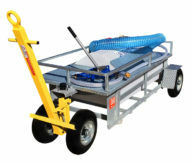 The RJ-Series carts set the standard for quality in aircraft ground support equipment. The LC270-RJ3E-SL – like all of AERO Specialties’ lav and water carts – comes complete with all required hoses, couplers, and fittings. The waste valve can be configured to meet any operation’s dumping requirements. 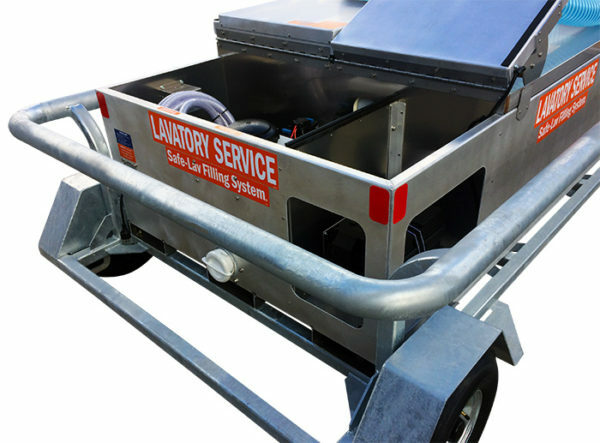 Compares to Tronair 204 Gallon Lavatory Service Cart/Unit, part numbers 10-6401-0010, 10-6411-0000. Note: Photos show unit with optional solar panel and coupler adapter kit. Onboard 12VDC battery and charging system.